Above: The fitting name for Woodland Park was especially enjoyed in its early years before Aurora Avenue was cut through it. This view looks south from a since razed pedestrian bridge that was built a few yards south of N. 59th Street, at the park’s northern boundary. (Courtesy, Municipal Archives.) Below: To repeat the historic photograph’s prospect, Jean Sherrard used a ten-foot pole and stood next to the surviving river rock wall that was created to support the now long lost bridge. CLICK TO ENLARGE then click again. . .
Thru its first decade – the 1890s – the Green Lake electric trolley line followed the grade of the abandoned logging railroad that nearly clear-cut the neighborhood in the late 1880s. The rails followed the east and north shores and then stopped at the lake’s northwest corner. After the Phinney family sold to the city in 1900 the country estate they named Woodland Park, the Seattle Electric Company completed the trolley line around the lake and through the park. That the park was appropriately named became easily evident during the city’s quarter century of truly explosive growth following its “Great Fire” of 1889. As the trees were felled for new additions with compass-conforming grids of streets and facing homes this preserved copse of soaring firs on Phinney Ridge increasingly stood out and up. It could easily be seen across Lake Union. It is now more than thirty years since I first studied the “then” photo featured here in the Sherwood Collection of Seattle Parks history. It is kept now in the Municipal Archives. A few of the photographs gathered by park historian Don Sherwood revealed other parts of the about half-mile north-south route the trolley took through the park although the photos were often not “placed” or otherwise identified. After a lot of comparing and map reading, at last I know – this part of it. The historical photo was recorded from a rustic pedestrian bridge that snugly crossed over the tracks between two picturesque walls or piers faced with hundreds of river rocks. 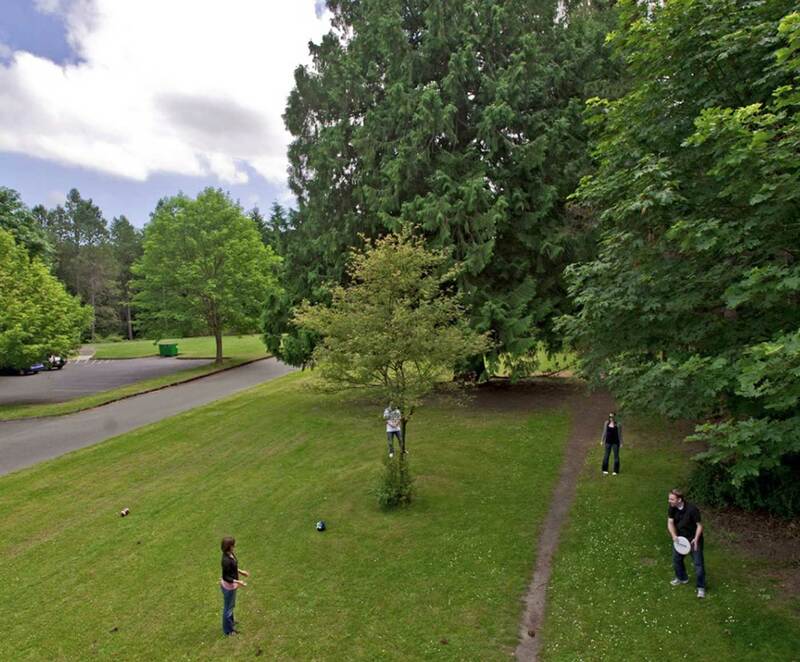 One of the approaches is gone but the west wall was kept, and can easily be visited on the auto-friendly road that climbs through the picnic sites from the tennis courts off West Green Lake Way North. The line was built in harmony with the park. Crossing shallow ravines, its wooden trestles, like the one here on the right, were appointed with rustic guard railings. 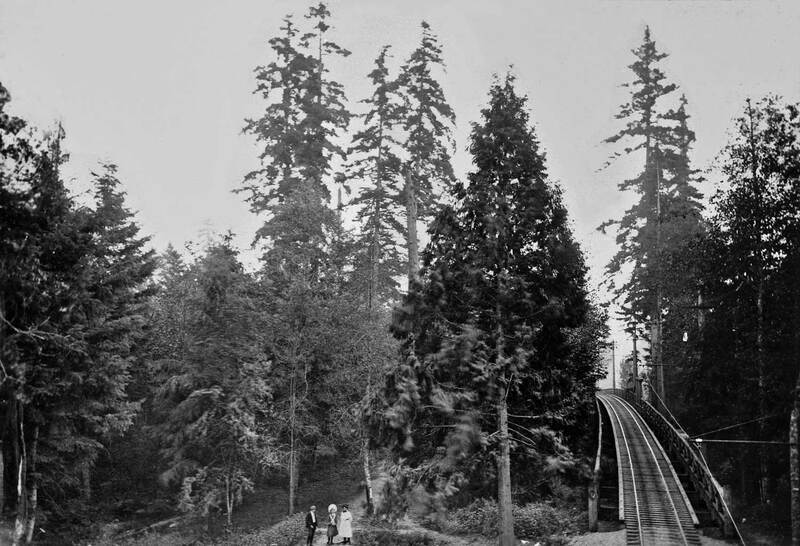 The Seattle Electric Company promoted the Woodland Park crossing as one of the picturesque highlights on their Seeing Seattle excursions. Jean, less add than link. We have with past features (on past Sundays) put up a few stories that touch on – or touch close to – this one. Ron Edge is searching for these, and will link them soon. All you will need to do is touch the pictures he chooses, and presto they will be with you. Meanwhile we will search for a few more fresh subjects that are also fitting.